Sit down and strap up! 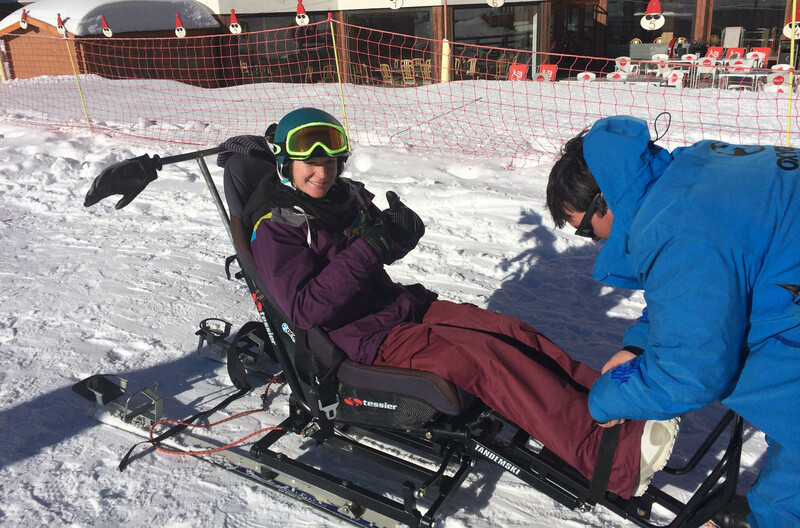 Fancy an armchair ski experience complete with a personal chauffer? Oxygène offer this awesome experience for anyone over the age of 6 to try out. If you can’t ski at all, have an injury, want to keep up with your family and friends but don’t have the skills or simply want to give your legs a rest, the Taxi Ski is the way to go. I did it this week and it is amazing! I met Adrien my chauffer/ instructor in the Oxygène shop in Plagne Centre where he explained the mechanics of this ‘tessier’ tandem ski to me. When we got outside I sat down with my legs stretched out in front and then he strapped me in with a shoulder harness and a belt across my legs. He showed me where he would stand on the back of the skis, the brakes he would be using and also the safety cord he wears which is attached to an emergency brake in case he were to fall off (which he assured me he wouldn’t do). We headed to the Bergerie chairlift, via the green slope; it gave me a chance to get used to the experience. Although I had to do absolutely nothing but sit still, it was difficult to get used to not being in control. When upon approaching an obstacle Adrien would wait much longer to change course than I would have done myself. But once I got my head around the fact that he was easily in control and very competently dodging the other skiers/ obstacles, it became much easier to sit back and relax. We arrived at the chairlift and cut down the side of the queue through the V.I.P entrance and prepared to board the lift. The ‘Lifties’ (people in charge of the lifts) were extremely helpful at corralling the crowds out of the way as Adrien maneuvered me into position. He tweaked a few parts of the chair and pulled up on the back until I was in an upright sitting position instead of the reclined posture of before. The chair lift came around and scooped me up smoothly and again I had to do nothing but sit. At the top I glided off easily with the help of Adrien and then with a few more adjustments to the chair I was back in my reclined position and ready to go. 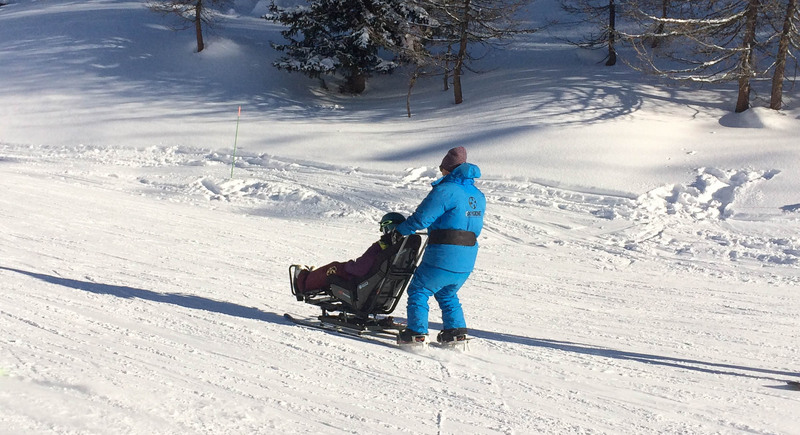 Adrien explained that the Taxi Ski can tackle any piste on the mountain of any colour, however un-pisted blacks are a bit tricky as they are not great on moguls. He also told me they are too heavy for off-piste, so in general they stick to mogul free pistes, this was fine by me! 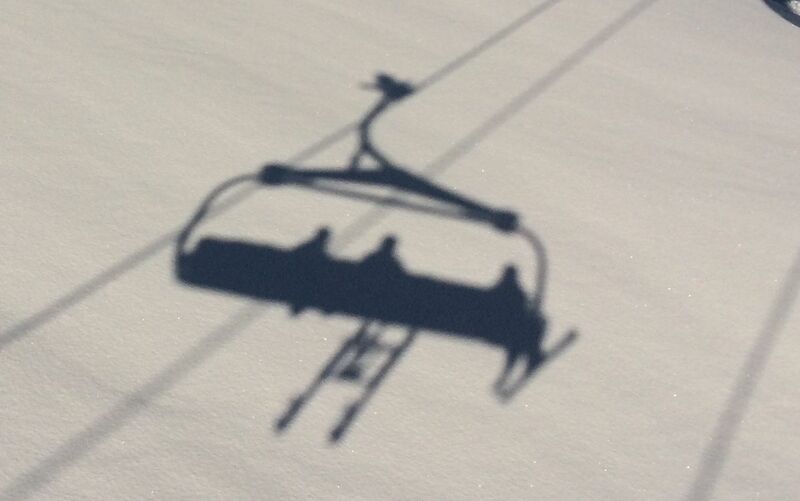 He waited for the piste to be quiet, pointed us straight down the mountain and took off. We were flying, leaping and jumping over bumps, shooting up hills of snow and down the other side, making huge carved turns that had my chair leaning right over to one side and then quickly back to the other. For one hairy moment he even turned us around and weaved backwards before spinning around again. We cruised through a natural half pipe, soaring up the sides and turning back on ourselves all the way down. It was exhilarating, we were hands down the fastest things on the mountain and the rest of our party didn’t stand a chance at keeping up. It was a far cry from the mellow mountain tour I had been expecting and is definitely La Plagne’s most underrated adrenaline sport… Only if you want it to be though! Upon booking the Taxi Ski, you can explain to your guide exactly what it is you want to do with your time. If you want to fly down the piste at hair-raising speeds you can (and you should its awesome!!). If you want to be out with your friends and family your guide will be happy to cruise around making sure you keep up with the crowd, get on the lifts together and don’t miss out on anything. If you’re a non-skier and just want to experience what it’s like out on the mountain, then put yourself in an Oxygène instructor’s hands and they’ll show you the best runs and sights of La Plagne. One piece of advice though, make sure that you layer up because as fast as you might be going, you are actually sitting very still in your chair and not doing any work so you can get cold very quickly. Make sure you wear all your ski gear including thermals, snow boots, gloves, buff or scarf, Oxygène can provide a helmet and a blanket if needed. You can book the Taxi Ski for a two hour session all week, or alternatively book yourself on the Wednesday night Moonlight Ski and give Taxi Skiing a go in the dark! It’s all about the Moonlight Ski!